because I grabbed the camera instead of opening the door! I laughed when I saw this on TT. I never dreamed it would be there! Thank you all for the great comments! @amyk Your comment made me laugh! Great shot, you can read exactly what he is thinking in that expression. Does look like it's a little concerned. Great shot. the screen makes it! so pitiful! I'm sure you made up for it! Thinks you're not playing fair! Cute. Ahhh...please let him in:) Cute shot! Aw he looks so sad. fav. LOVE this photo, and oh, if I haven't done the same on any number of times!!! The look on that face says it all, fabulous shot! Haha! Looks like our cat every morning when he wants to come in for breakfast. Lol - what an image - he looks almost like a cartoon cat!! Oh, that sad little face. Super! Ooh ! poor kitty !! What a sad little face ! Oh dear mummy let me in purrrrrleas. Aww such a pleading look on it's face! Oh the look on the face! Awww what a sad face! awww hahaha! made for a cute photo though! He really looks miserable ! Aww, this is adorable. 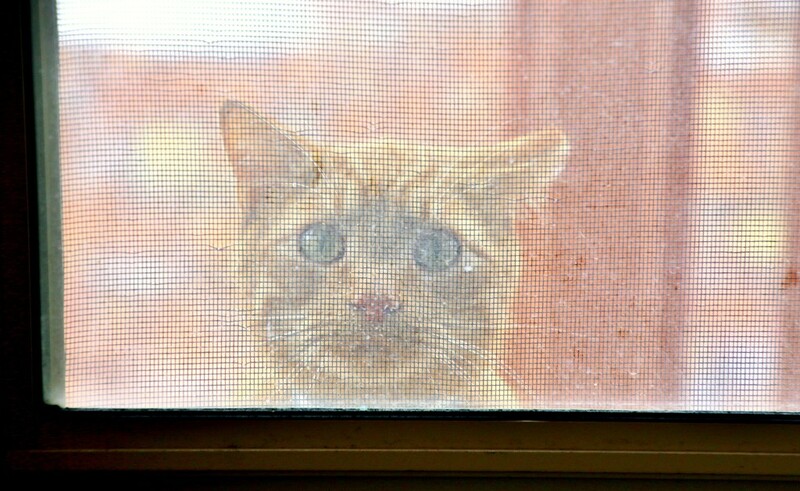 Poor kitty wants in. Entertainingly pitiful! You caught a great expression, but I'm sure kitty knows that the camera ranks first! I missed this adorable capture! Fav. Congrats on the TT!